Today is the BEST kind of Monday... a holiday! I am off from school and relishing the long morning. Leftover whole wheat biscuits from the weekend, with greek yogurt and banana. This weekend started early on Thursday with drinks and dinner with a friend from Junior League. We met at a place in our neighborhood and sipped champagne cocktails while catching up. Ladies, if you have not checked out the Junior League in your area, I highly recommend it! I have met so many wonderful women and learned so much about my community. Such a wonderful civic and social activity for me :) They have a million events going on each month, plus awesome training and volunteer work with some of the biggest non-profits in Atlanta. Two of my very favorite people joined me on a dress shopping adventure. 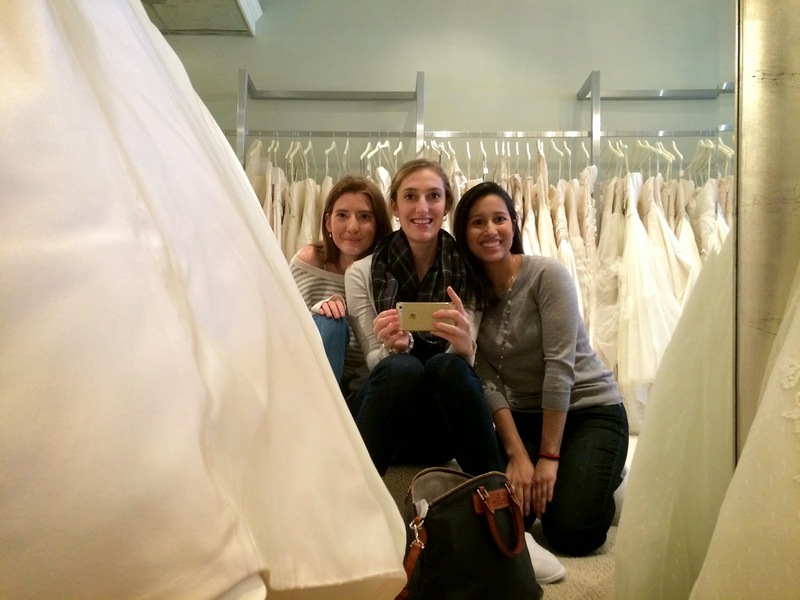 We went to Fabulous Frocks in Atlanta and tried on dresses for 3.5 hours. The woman who owns this store is seriously the best - she was so kind and helpful. I didn't buy anything - waiting for mom's visit! - but I plan to head back to Fabulous Frocks. Their collection was so wonderful and the staff was fantastic. I am so glad that this store was recommended to me! I met with a wedding planning on Friday afternoon and went out for a birthday dinner with friends that evening. No pictures - we were having too much fun. The rest of the weekend was lazy and relaxing. AR and I became members of our church on Sunday, which was so exciting. I really enjoyed the couples in our membership class and I was excited to meet so many other youth engaged couples. How many dresses did you try on before finding the one? Who did you/will you take with you when you go dress shopping? Thanks for hosting, B Loved Boston and Champagne & Suburbs!